Frank Frederick Reuben Raison was born in 1880, day and month unknown. There is no baptismal entry for him but on the 1881 census he is given as being 6 months old. He was the son of Reuben and Susan nee Collett and was one of nine children. His father was employed as a cellar man and his mother worked as a laundress, taking in washing from other families in the area to earn a few extra coppers. They were living in Herries Street at this time. From Poor Law records Frank was admitted on the 12th of December 1890 with some of his siblings. This was after the death of his mother. His father had been admitted into the workhouse. Frank was discharged by his father on the 9th of March 1891 and by the time of the census the family were living in Mornington Road in a property with six other families. Frank’s father was employed as a painter. Both Herries Street and Mornington Road were in a poor and run down area and were both coloured dark blue on the poverty map, areas of chronic want and one up from the lowest criminal class . Frank was admitted to the district school on the 18th of March 1892 as his father was once more in the workhouse. His date of sending out from the school was on the 11th of June 1895 when he was fifteen. His master was Mr. C. White of 1, George Road, Holloway, a boot and shoe repairer. Frank was bound for five years. Follow up reports on him throughout the month of May 1896, however, found his conduct to be unsatisfactory and his indenture was cancelled on the 14th of May 1896. Frank’s father died in 1899 but by then Frank had already enlisted into the British army. Frank’s service records are a bit sketchy but they do reveal that he originally enlisted with the 3rd Royal Fusiliers on the 9th of May 1897. His occupation was given as bootmaker. He was aged 17 years and 10 months old. He was 5 feet 6 inches tall and of fair complexion, with blue/gray eyes and brown hair. He had a large vaccination mark on his left forearm. On the 2nd of July 1897 he was transferred to the Dragoon Guards. The Dragoon Guards was the designation used to refer to certain heavy cavalry regiments in the British Army from the 18th century onwards. In 1746 the Kings Own Regiment of Horse, The Queens Own Royal Regiment of Horse and the 4th Horse were re-designated as the 1st, 2nd and 3rd Dragoons respectively. The exercise of converting from “Horse” heavy cavalry to “Dragoons” formerly mounted infantry was intended to save money. Dragoons were paid less then Horse and the change was very unpopular. 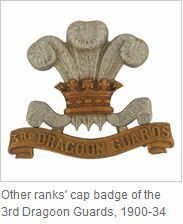 To compensate for the loss of pay and prestige, the impressive title of Dragoon Guards was adopted. The 3rd Dragoon Guards sailed on the Victorian on the 22nd of January 1901. On arrival in South Africa they were put into Colonel Bethune’s brigade and they were involved in frequent sharp fighting in the Orange River Colony particularly in the Vrede district but escaped with comparatively light casualties. They operated in the Orange River Colony for the greater part of 1901. 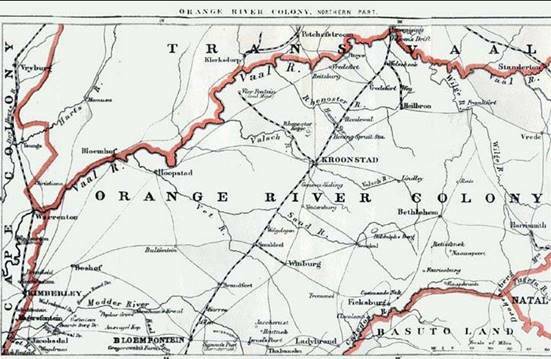 Map of the Orange River Colony showing Kroonstad. Ancestry’s Boer War records show that Frank died at Kroonstad of disease. General Hospital N0 3 was based at Kroonstad. The hospitals were static, either tented or created by taking over existing public buildings. We cannot be sure exactly what Frank died from. Enteric fever (typhoid) was prevalent and cost the British Army more lives than those killed in battle. Out of 21,000 British deaths during this war, only 8,000 were attributed to wounds received on the battle field. Frank was aged 21 when he died and Ancestry shows in it’s “ Soldiers Effects “ records that five of his living siblings received £1 16s 9d each. 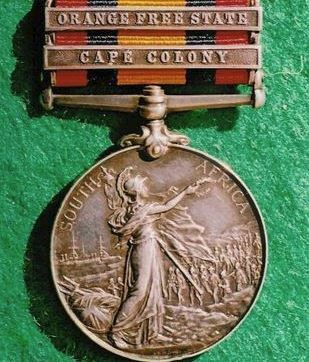 Frank was entitled to the South African medal with the Orange Free and Cape Colony Clasps. SOURCES :- Find My Past, Ancestry, Wikepedia, Anglo Boer War .com, National Army Museum, The Boer War Hospital and Disease-available online, The Unit History of the Dragoon Guards, Map of Kroonstad available online. Henry Spinks was born on the 24th of October 1875 in Kensington, as recorded in the 1939 register. He was the ninth of ten children born to George and Harriet nee Longton. They were both from Scotland originally. George was employed as a wood turner. On the 1881 census the family are living at 117, Glenthorne Road, Hammersmith, and Henry was aged five. In 1882 Henry’s father died and Henry and his older brother George were admitted to the Britten Street workhouse ( date unknown) and then both discharged to Beechholme (ensington and Chelsea District School) on the 22nd of November 1884. Henry was discharged from the school on the 19th of February 1891 to the army, attesting on the following day with the 5th Dragoon Guards at Aldershot. He was 15 years old and his occupation was musician. He was 4 feet 7 inches tall and weighed just sixty eight pounds. He had grey eyes and light brown hair. Distinctive marks were two dots on his left forearm. For some reason Henry states he has no next of kin. The 5th (Princess Charlotte of Wales) Dragoon Guards arrived in Natal from India before the Boer War began. After the initial British successes at Elandslaagte and Talana Hill, General White lost the battle of Ladysmith and quickly found himself enveloped by the advancing Boers. On the 2nd of November 1899 the railway line was cut south of Ladysmith; on the last train out were Major General French and his chief of staff Major Douglas Haig who were lying on the carriage floor amidst a hail of bullets, escaping to command the newly arriving cavalry division. The warfare in Natal was beyond the capabilities of the elderly General White, requiring knowledge of the country which he did not possess. Fighting the well armed Boers required active and accurate reconnaissance and intelligence. White knew that he should not permit his force to be pinned into a useless minor township. He should have retreated precipitously to avoid being caught in Ladysmith but he could not bring himself to abandon the stockpile of army supplies in the town. When Buller arrived in Capetown the expectation of him was that he would invade the Orange Free State at a point of his choosing. The strategic pendulum would have swung firmly in Buller’s favour. Buller could not permit such a large force as White’s to fall into the hands of the Boers. He was forced to abandon any notion of invading the Free State for a slogging match across the Tugela river to relieve Ladysmith. The siege quickly developed into a monotonous routine with artillery bombardments conducted by either side each day. On the 6th of January 1900 the Boers launched an attack on Ladysmith designed to overwhelm the garrison. 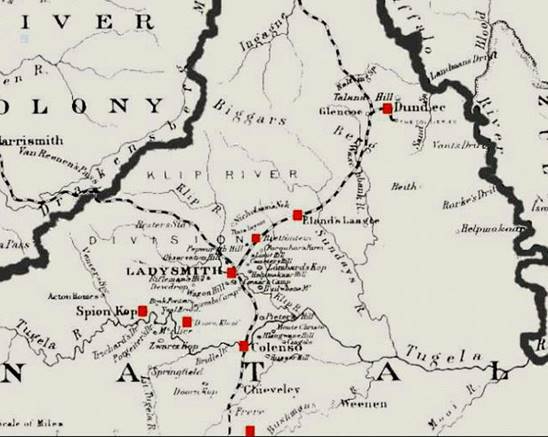 Attacks were launched around the Ladysmith perimeter. The main Boer attack fell on the crescent shaped hill on the southern perimeter known as Caesar’s Camp. Due to the indolence of the generals in this sector the area was largely bereft of entrenchments. The Boers approached the brow of the hill in two columns. They then rushed the British positions and a confused fight took place in the dark. Reinforcements were brought in and fierce fighting ensued. The Boers were finally driven back. During January 1900 supplies in Ladysmith became seriously short so much so that the remaining cavalry horses were shot for food. On the 27th of February 1900 the British pickets on Wagon Hill saw the Boer besiegers trek away across the Veldt and Buller’s troops marched into Ladysmith. The siege was over. In the northern advance from Ladysmith to the Transvaal the 5th Dragoon Guards came under brigadier General Burn-Murdoch who, in his final despatch in November 1900 mentioned officers and men for their gallant work having routed a commando of 400 with a party of just twenty men. Map of the siege of Ladysmith. In the first quarter of 1901 the regiment had arduous work in the south east of the Transvaal while General French was driving Botha’s forces into that angle. They frequently had skirmishing, but perhaps their hardest work was the escorting of convoys from the railway to French’s men during a time when weather scarcely ever faired up for weeks at a time, and the endless spruits (small streams) could only be crossed with great difficulty. The regiment afterwards was taken to the western Transvaal and did much work in the Kierksdurp district. They were for a while in columns under Brigadier Hamilton east of Pretoria. The regiment sailed for India shortly before peace was declared. Henry was awarded the Queens South African and Kings South African medals with Defence of Ladysmith, Cape Colony and Transvaal clasps. After completion of his period of engagement Henry re-enlisted with the Kings Own Scottish Borderers on the 28th of July 1905. Army records show that by now he weighed 121 pounds and had many tattoos on both arms. He was appointed to the rank of Bandsman in December 1906. Then he forfeited a good conduct medal through drunkenness. Henry was detained for attempting to commit suicide on the 10th of October 1907 and was found guilty by court martial and sentenced to 28 days detention. At a medical hearing at Netley Henry was judged to be “insane” and discharged as unfit on 25th February 1908. His intended residence was that of his mother Harriet in Shepherds Bush. Henry married Susan Humphrey at Uxbridge in 1910. When the 1911 census was taken the couple with their infant daughter Lily were living in Norwood and Henry was described as being a musician and was employed as an attendant at the London County Asylum. The 1939 register shows Henry living with his wife at 85,Green Lane, Ealing. His occupation was a retired male nurse, mental. Henry died in 1940 in the Brentford registration district. SOURCES :- Ancestry, Find My Past, Wikepedia, Anglo Boer War .com, British Battles.com, Map available online. Sadly there is no information concerning this man prior to his Boer War service. The Boer War panel states that he was a drill instructor, probably at the school, but he cannot be identified on any census return and unfortunately even his Christian name is unknown. The 1st Border regiment sailed from Malta on the 27th of September 1899 landing at Cape Town on the 21st of October where they proceeded to De Aar and after two days were taken by steamer to Durban. Along with the 1st Inniskilling Fusilers, 1st Connaught Rangers and the 1st Dublin Fusiliers they formed the 5th Brigade under Major General Hart. On the 15th of December 1899 they attacked at Colenso with the object of crossing the Tugela river. No proper reconnaissance had been carried out. The attack proved that the river could not be crossed in daylight whilst under fire and heavy casualties were suffered before the retreat was ordered. Six men were killed and three officers and forty two men were wounded. The battalion was specially mentioned by General Buller. At Venter’s Spruit the battalion was heavily engaged on the 20th of January 1900 and between the 20th and 26th of that month lost one officer and seven men killed, and four officers and about one hundred and thirty three men wounded. After much fighting in the hills by the Tugela river the force at last broke through and Ladysmith was relieved on the 28th of February 1900. 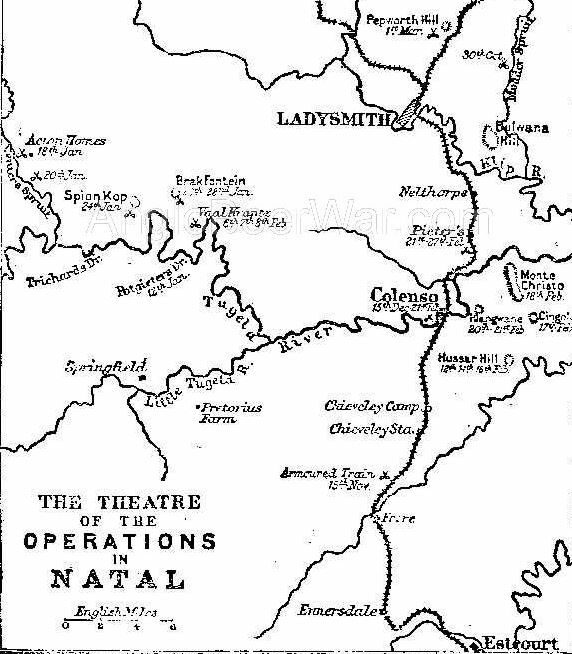 Map of the operations in Natal around the Tugela river at the end of 1899 beginning of 1900. The regiment marched many miles over the Veldt during the guerilla war that followed.In the middle of April 1900 the 1st Border regiment went to Irene, south of Pretoria and were posted east of there under Mahon. On the 9th of July General French with Mahon’s troops “ engaged the enemy and pushed them back beyond Bronkhorst Spruit. On the 12th of July 1900 the regiment marched back to Pretoria. It was here on the 26th of August 1900 that R. Stevens died of pneumonia, his name featuring among casualty lists in newspapers held by “Find My Past”. His medal entitlement was the Queens South African medal with Orange Free State, Transvaal and Natal clasps. R. Stevens name is inscribed on the Border regiment memorial in Carlisle cathedral on a bronze plaque on the west end of the south wall. SOURCES :- Find My Past, Ancestry, Anglo Boer War .com, The History of the Boer Regiment (online), Map courtesy of Anglo Boer War .com. Walter Stevens was born on the 30th of May 1879 within the borough of Kensington. His date of birth was taken from Poor Law records. He was the son of Patrick or Charles Stevens and Emily, surname unknown. There is no entry of marriage for the couple and the children’s births, apart from the eldest, appear to be unregistered. Emily was the mother of five sons all of whom at some point were resident in Beechholme. On the 1881 census Emily with Patrick Stevens was living at 28, Silchester Terrace. Patrick was employed as a bricklayer. The family lived in shared accommodation with four other families. This part of London, Notting Dale, was designated by Charles Booth in his survey as being among London’s poorest. Notting Dale was built up with sheds and shanties, and from the 1860’s onwards was filled with cheap housing to accommodate men and women driven from places such as Marble Arch and Paddington. Not far from the affluent neighbouring area with their mansions and villas Charles Booth recorded “terrible hardship just a few hundred yards west of wealth” In 1893 the Daily News claimed Notting Dale was the most "hopelessly degraded" place in London. Poor law records reveal that on the 19th of October 1883 Walter and two other brothers were transferred from the parish to Beechholme. The records also note that their father was in prison, his name was then given as Charles, and the mother Emily’s whereabouts were unknown. She was later admitted to the workhouse. Walter and a younger brother Henry were resident in Beechholme on the 1891 census. Walter enlisted on the 23rd of January 1893 at Aldershot. His age was given as fourteen years and seven months and his occupation recorded as musician. The records state that he had attended the Kensington and Chelsea District Schools. He was four feet eight inches tall and weighed seventy five pounds. He had a fresh complexion with blue eyes and light brown hair. He had no distinguishing marks. Walter was appointed bandsman on the 15th of July 1893. The 5th Dragoon Guards sailed to India on H.M.S. Serapin arriving at Meerut in October 1893 where they would remain for six years. Walter’s regiment arrived in Natal from India and the work of the Dragoon Guards during the 2nd Boer war is told in other men’s stories. Walter’s time in South Africa was curtailed when he was invalided back to England at the end of February 1901. He was awarded the Queens South African medal with Orange Free State, Transvaal and Defence of Ladysmith clasps. Walter remained in England until the 20th of March 1902 when he returned to Lucknow in India with his regiment. 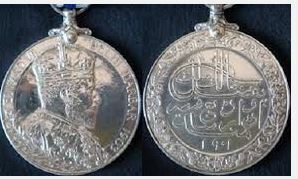 While here Walter was awarded the Delhi Durbar silver medal, an example of which is shown below.. The Delhi Durbar was a mass assembly at Coronation Park in Delhi, India to mark the succession of an Emperor or Empress of India and was held in 1877, 1903 and 1911 at the height of the British Empire. The medal was presented to men and officers of British regiments serving in India at the time. The obverse of the 1903 medal depicts the crowned head of the King facing right wearing an ermine robe of state with the collar of the Garter and badge of the Bath. Below the bust, a branch of laurel with the legend “Edward VII Delhi Durbar 1903” and on the reverse inset within a floral wreath of roses a Persian inscription translated “ By the favour of the Lord of the realm Edward, King, Emperor of India”. Walter remained in India until the 14th of March 1904 when the regiment returned to South Africa for a further year. He was promoted to Lance Corporal in April of 1904 but later forfeited his lance stripe and a good conduct medal though the army records give no reason as to why. His next of kin was given as his mother and brother George both of Rendle Street Kensington but these are both crossed through. George was serving with the 58th Company of the Army Service Corps. Walter returned to England at the beginning of 1905. He then re-enlisted with the Kent Royal Garrison Artillery on the 4th of May 1905. These records show that he had lived in Bloemfontein in the Orange River Colony during 1904. His age was given as 26 years and 10 months and his occupation as musician. He was a single man and his previous service had been with the Dragoon Guards. Walter was 5 feet 4 inches in height and weighed 137 pounds. He now had a scar over his left eyebrow. His rank was given as gunner and his character was described as very good. His next of kin was given as his older brothers George and Charles but no addresses were provided. The service records end here and unfortunately Walter cannot be identified definitively on any other record. SOURCES :- Find My Past, Ancestry, Anglo Boer War.com, Wikepedia, The History of the Silchester Estate- available online. George Emanuel Stevenson was born at Hammersmith on the 24th of May 1878. His date of birth was taken from Poor Law records. He was the son of Emanuel and Ann nee Sellwood. George was one of at least fifteen children fathered by Emanuel who had been married twice, his first wife dying in her early twenties. Emanuel was employed as a farrier. He was originally from Berkshire and had served two terms of imprisonment for larceny, one in Berkshire for three months and a year's term in Oxfordshire when he had stolen eight pocket knives from his employer. Bans of marriage for Emanuel and Ann were read in 1868 but the couple did not marry until 1874 when he declared himself to be a bachelor. On the 1881 census the family were living at 6 Camden Street, Kensington, and George’s age was given as two. This was described by Charles Booth as a good working class road and was coloured pink on the poverty map. Poor Law records show that Emanuel deserted his family in 1887 and both George and a younger sister Ernestine were admitted to Beechholme on the 2nd of September 1887. Another brother, Burt, was admitted at a later date. Ann was living in Princes Street at the time with a married daughter. She was caring for her youngest child by going out charring. Two older girls were also living there and employed in the same manner. The 1891 census shows the three siblings resident in Beechholme. George was sent out from the school on the 6th of May 1893 to the 17th Lancers band but was later transferred into the 5th. An annual follow up report dated August 12th 1896 states " Bad report". There don't appear to be any further follow ups on him. His service records give his age as fourteen years and eleven months and his occupation given as musician. His army records show that he was educated at the Kensington and Chelsea schools for four years. His height was four feet seven inches and he weighed seventy one pounds. His chest measurement was twenty seven inches. He had a fresh complexion with grey eyes and light brown hair. He had no distinguishing marks. His next of kin was given as an older brother Frederick, whereabouts unknown, and his mother Ann of 78, Princes Street, Notting Hill. George was passed fit for service in the Corps of Lancers of the Line. The regiment sailed for India on H.M.S. Malabar arriving on the 26th of March 1896. While in India George suffered several bouts of tonsillitis and ague (a fever), also a dog bite and two incidences of gonorrhoea . The regiment was then sent to South Africa and landed there on 11th of March 1898. George suffered further periods of ague, which was put down to the climate and while at Ladysmith he was treated again for gonorrhoea and enteric fever. George was awarded the Queens South African medal with Cape Colony, Orange Free State, Transvaal, Elandslaagte and Defence of Ladysmith clasps, also the Kings South African medal with 1901 and 1902 clasps. In taking part at Elandslaagte on the 21st of October 1899 the 5th Lancers had the satisfaction of knowing that they took part in the one real cavalry charge of the campaign, because, after all, on the way to Kimberley it was a gallop through a position, not a charge in the old sense. Along with the 19th Hussars and Imperial Light Horse, the regiment were in the action of Rietfontein on the 24th of October. The 5th Lancers seized and held ridges to protect Sir George White’s right flank. In the battle of Lombard’s Kop or Ladysmith on the 30th of October the 5th Lancers and 19th Hussars were under General French on the right, their objective being to get round the enemy’s left, but the cavalry were pushed back as so strong was the opposing force. Throughout the siege the 5th Lancers frequently had fighting. In his despatch of 23rd of March 1900, Sir George White, speaking of a reconnaissance made on the 8th December 1899 says “ It was carried out in a very bold and dashing manner” They were sent to reinforce Waggon Hill in the great attack of the 6th of January. The miseries of being constantly under shell-fire are apt to be lost sight of, but the fact that on 22nd December one single shell wounded five officers and the Sergeant Major of the 5th Lancers, makes one realise the ever-constant danger and strain during the four months siege. In the northern movement under General Buller the 5th Lancers accompanied the General to Lydenburg and on this march were very frequently engaged and between the middle of July and the end of September were fighting practically every day. At the beginning of November 1900 about 250 men of the regiment were with Smith-Dorrien, south of Belfast, when he had very hard fighting and no little difficulty in saving his guns. During the second phase of the war the 5th Lancers were mainly in the Eastern Transvaal operating under Smith-Dorrien, Spens and other commanders. A portion of the regiment was in Cape Colony in 1901 and 1902 and had rather an unhappy time on the Zeekoe River near Aberdeen on 6th April 1901 when they lost 2 killed, 9 wounded and 23 taken prisoner. Four non-commissioned officers and men of the regiment gained mention in despatches by Lord Kitchener, written during the war, and in the final despatch 2 officers, 2 non-commissioned officers and 2 men were mentioned. After the Boer War George re-enlisted into the Royal Army Medical Corps on the 13th of June 1905. His age was twenty seven and after six month gymnastic course he had attained the weight of 128 pounds. He was now five feet six inches and his chest now measured thirty seven inches when expanded. He married Ellen (Nellie) Hammond at Christchurch, Battersea on Christmas Eve 1905 where his occupation on the entry of marriage was given as Bandsman with the Royal Army Medical Corps. Their son Charles George was born in February 1906 at Battersea. George had two periods of hospitalization for tonsillitis in a military hospital at Aldershot. On the 1911 census the family were living in Belle Vue Road in Aldershot and George was described as being an army private. He was aged thirty two and his wife was twenty eight. Their son was five. They adopted another child called James in 1912 who had been born in West Ham. On the 12th of June 1913 George was discharged from the army at his own request. George re-enlisted on the 10th of December 1915 into his previous regiment the Royal Army Medical Corps. He was employed in home service only. His age was thirty seven years and seven months and his occupation was given as a postman. His next of kin was his wife and they were living at 2, Cedar Cottage, Frog Lane, Farnborough. He was demobbed in 1919. On the 1939 register George and Nellie were living at 20, Holly Road, Farnborough and his occupation was given as a retired postman. George died on the 7th of August 1963 at Park Prewett hospital in Basingstoke at the age of eighty two. This hospital was the Hampshire County Asylum. In his will he left £1859 18s to his son Charles who was an engine fitter. His wife had pre-deceased him. SOURCES :- Find My Past, Ancestry, Anglo Boer War.com, Wikepedia.